Members of the Nevis Island Administration Cabinet: Left to right, the Hon. Eric Evelyn; the Hon. Hazel Brandy-Williams; the Hon. Spencer Brand; the Hon. 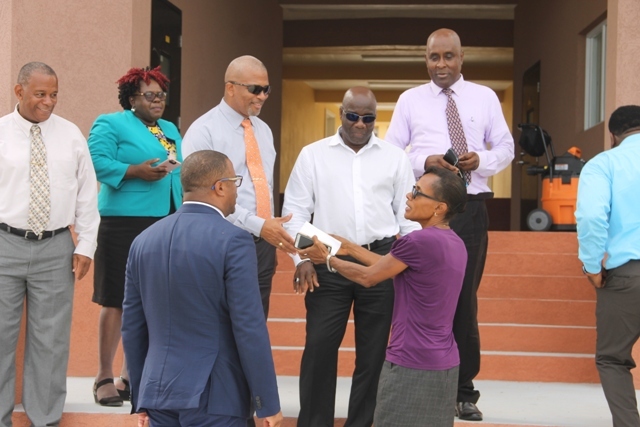 Alexis Jeffers, Deputy Premier; Stedmond Tross, cabinet secretary; the Hon. Troy Liburd. First row: the Hon. 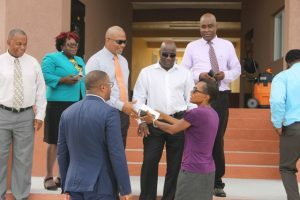 Mark Brantley, the premier of Nevis, with Lineth Williams, principal of the Gingerland Secondary School, while visiting the school’s new office complex June 6. 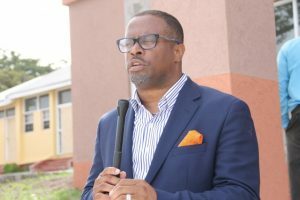 CHARLESTOWN, Nevis – The Honourable Mark Brantley, the premier of Nevis, says the Nevis Island Administration is designing projects that will enhance the lives of the people of Nevis. He made the comment June 6 at the end of a tour by the NIA Cabinet of five ongoing projects, all at varying stages, ranging from road works at Upper and Lower Stoney Grove and Brown Hill, the completed new office complex at the Gingerland Secondary School and renovation works at the Cultural Complex in Charlestown. Also present on the tour were Deputy Premier the Hon. Alexis Jeffers, the Hon. Eric Evelyn, the Hon. Spencer Brand, junior ministers the Hon. Hazel Brandy-Williams and the Hon. Troy Liburd, and Stedmond Tross, cabinet secretary.